This is part two of my series on understanding your camera’s exposure settings. Part one is about ISO. Hopefully, you have a good grasp of ISO by now and you are almost ready to start getting your fancy camera out of “Auto” mode. I mentioned in the first part of this three-part series of articles, that getting out of auto mode allows you to be more creative with your camera and that this begins with understanding three primary settings. I had mentioned that ISO was the easiest concept of the three exposure control settings to understand, but shutter speed is very easy, too. Here is something obvious: A photograph is made by capturing light. Your camera controls the amount of light that is captured. Imagine you are wandering along with your camera. Light is all around you. It is bouncing off everything, and some goes into the lens of your camera. The lens takes that light and focuses it into a tiny spot. Because the shutter on your camera is closed, the light doesn’t make it (far) into your camera. To allow the light to get into the camera, you have to press the “shutter release button”. The big one that takes a photo! The shutter release button causes the shutter to open then close, allowing a certain amount of light to pass into the camera body. The light is then detected by the sensor, and your camera builds a photograph. You can change how long the shutter stays open for, and this will control the amount of light entering the camera, and therefore the exposure of the photograph. Think of this example. Even if you understand now, this exercise will help with part three when we talk about aperture. Imagine you have a piece of pipework that carries water. The pipe has two controls. We are only going to worry about one of them. The control we care about is the on/off button. When the pipework is “on”, water can flow. Otherwise, no water can pass. We also have a bucket. We want to fill the bucket “perfectly”. We want it filled to the brim, but we do not want to spill any. Therefore, there is an exact amount of time that we need to have the pipework “switched on”. If it isn’t on for long enough, the bucket is underfilled (the photo is underexposed – too dark). If it is on for too long, water spills and ruins your carpet (the photo is overexposed – too bright). The range available to you will depend on your camera. But to give a couple of examples, I have a Samsung Galaxy S8 and my Nikon in-front of me. If I put my camera in “pro” mode, I can change the shutter manually to “1/24000”. This is the fastest the shutter will operate and it just means one twenty-four-thousandth of a second. I can move it to the slowest speed, which is “10”, or simply, ten seconds. Controls vary by camera, but if I put my camera dial into the M, S, or P modes (more on this in a future article), I am able to change my shutter speed with one of the control dials. If I turn it all the way, it will say “Bulb”. Again, more on that shortly! One click back again and 30″ is the slowest. This is thirty seconds. Much like the Samsung, but Nikon has added quote marks so that you know it is seconds (and not one thirtieth of a second). At the fast end, 8000 is simply one eight-thousandth of a second. If you camera is in bulb mode, it simply means that the shutter will stay open for as long as you hold the button down on the camera. A common use of this feature is in astrophotography, where photos of stars in the dead of night need a long time to expose. For any type of photography where you have the shutter open for a longer period of time, you are going to need extra equipment, some of which I have mentioned in the column opposite. Why Use Manual Shutter Speeds? Most of the time, your camera will select the right speed for you, but it will generally try to “freeze” action. Sometimes, you might want to be creative. Ever see those photos of waterfalls where the water looks creamy and white? It looks that way because the shutter was manually selected to remain open longer. The water is actually blurred and looks milky. How about shots where crowds of people are walking through a busy street and everyone is a blur? Similar technique. If your shutter will be open for more than, approximately 1/80th of a second, you will need a tripod. It is around this setting that you will no longer be able to keep the camera steady enough when holding by hand. 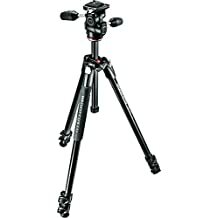 One of the best tripod brands is Manfrotto, and the MK290XTA3-3WUS is a good choice for most work. The MK290XTA3-3WUS is available from Amazon Canada and Amazon UK . You’ll also want to investigate remote shutter options and maybe an ND-Filter, but they go beyond the scope of this article. Sometimes you might want the shutter to operate more quickly. Perhaps at a sporting event or during wildlife photography, where animals can move quite suddenly. Altering your shutter speed manually could help you here. Remember, ISO changes the sensitivity of your camera (thus how much light will then be needed). Shutter speed changes how long the shutter is open (thus how much light is received by the camera). If you increase the ISO (sensitivity), the shutter can operate faster because it doesn’t need to be open as long. But remember that a higher ISO can introduce more noise. If you increase the shutter speed (more light gets in), the ISO can be lower. This reduces the noise… but if the camera or the subject in your photo moves, you’ll risk getting a blurred photograph. It is a question of priorities and balancing the two settings. This article is about the principles of these settings and is not intended to be an exhaustive list of all possible situations and their ideal settings. But… while you wait for part 3 on aperture, have a think about what photograph you would like to capture. A waterfall? A sporting event? Just hop onto Google and search for what priority your settings should have for the situation you are interested in. As you practice and actually try things out, you will come to realise how it all fits together. I hope this article was of help. I will leave you with a couple of photographs I have taken where altering the shutter speed was a primary part of the final result. This photograph was taken early in the morning, with the sun rising up behind the silhouetted tree. It was still dark. Therefore, I left the shutter open for longer, helping to expose the photo better. As a bonus, having the shutter open for longer can sometimes lead to capturing bolder colours, like in this sky. For this image of a marshy pond, I really wanted to bring out the reflectiveness of the water. By leaving the shutter open for longer, any ripples caused by wind or animals is “averaged out”. I needed to open the shutter for at least 20 seconds, but it was very bright out. Even with my ISO set to the lowest (least sensitive) setting, the photo was coming out too bright. I had no settings left to play with to get the shutter where I wanted it…. so I made use of another tool. An ND Filter is essentially a piece of tinted glass that fits over the end of your lens. It blocks light. Now I could leave my shutter open for 20 seconds, have my ISO at 100, and still get a shot that wasn’t overexposed. ND Filters are available for a range of cameras and vary in price from maybe $50CAD to several hundred. Check with your local store to see if they can help you.